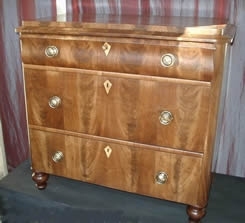 We repair all antique and modern furniture, large or small, and house joinery. 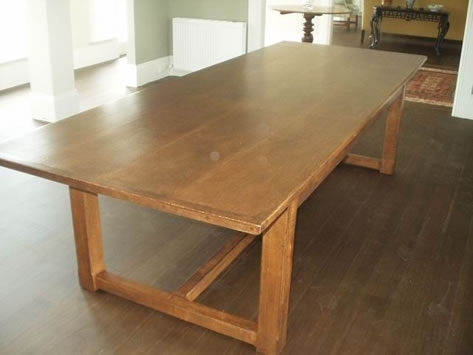 Appleyard Antiques has been restoring and conserving furniture and joinery for over 30 years. We pride ourselves on excellence at a fair price. We prefer to keep antiques looking patinated and choose to revive old surfaces, if possible, but we will refinish if necessary. We can take out surface stains and marks without disturbing the patina on your particular peice. We can also repair or remake anything broken, cracked, loose or missing altogether. 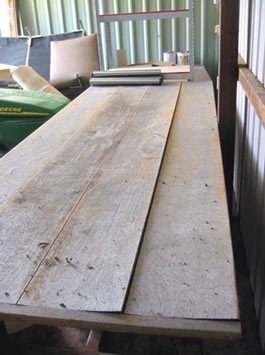 Our conservation and restoration method protects, preserves, and restores timber pieces to the highest possible standard. House joinery restoration, including staircases, archives, skirting, floors, windows and doors. The table top suffered extensive weathering; cupping of the top boards and breaking of all joints. The finish was completely ruined and the timber had become the colour of a fence post. Restoration entailed dismantling the top, replacing the end clamps which had both split, and uncupping the top boards in exactly the same way they had cupped: leaving them face down in the weather for many weeks. After the sun had pulled them back into shape, the top boards were rejoined, reclamped and the whole table lightly sanded and refinished. Sometimes you get a nice surprise. 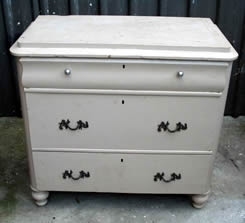 Before buying this chest I could see the print-through of veneer and a nicely moulded top drawer under a layer or 2 of paint. Careful hand stripping revealed a lovely figured walnut chest with vertical matched veneer and quartered top, complete with contrasting diamond fruitwood escutcheons. 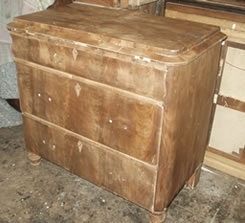 The chest required some timber patching and regluing before light polishing and the addition of some bold period handles.